This year my work for the Travel Foundation took me to Saint Lucia, where two projects are currently running. These are some of my favourite pictures from the shoot, and the stories behind them. 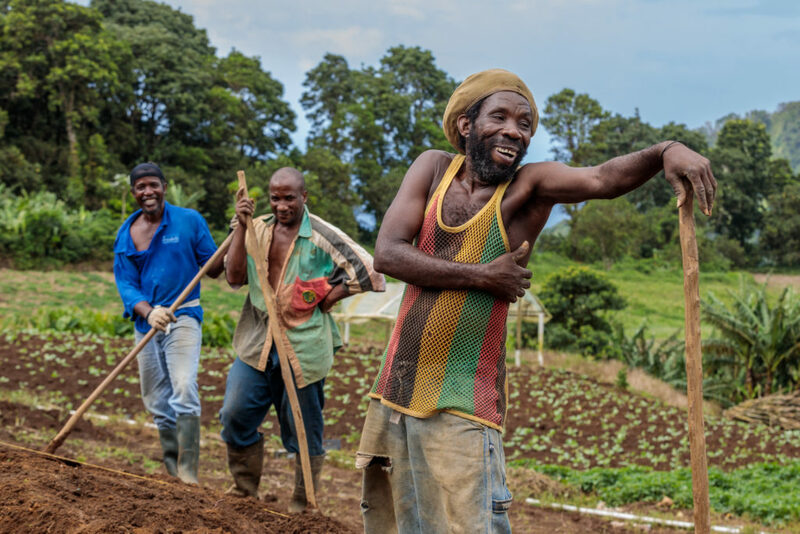 High up in the mountains of Fond Saint Jacques, I joined Raphael and his colleagues – farmers who were digging potatoes and managing to stay in good humour despite the rain. 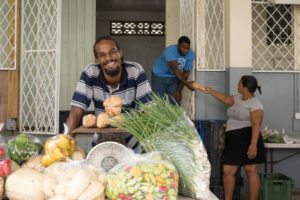 They are part of a scheme called the Virtual Agricultural Clearing Programme, run by the Saint Lucia Hotel and Tourism Association, that uses simple technology such as Whatsapp groups to connect local farming cooperatives to hotels and restaurants. For instance, a farmer might get a request for a 200 weight of potatoes, which are then put onto a truck and taken down to the cooperative and on to the hotel. Food doesn’t get much fresher. I took these images to help illustrate the idea of looking at ‘hotspots’ in the tourism supply chain where greenhouse gas emissions might be reduced (the aim of the Travel Foundation’s project). Systems like this help to reduce food miles and the amount that must be imported. I had a great time with the farmers – they pulled some fruit from a tree and we ate it together, talking about how the crop of potatoes was coming along. Later on in my visit, I went to capture images for another project, Lionfish on the Menu, which aims to control the proliferation of this species in local waters. 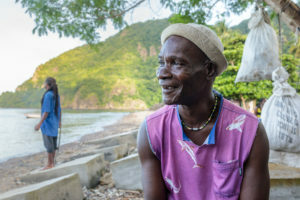 Saint Lucia is one of the last Caribbean islands to be invaded by lionfish, so fishing communities are developing new skills to deal with the problem. I went out with fishers collecting traps, like Vincent (above) who was handling the fish with scoops made from plastic bottles. Gloves are needed to manage the fish more easily and avoid its venomous spines, and that is one of the things the Travel Foundation will provide as part of this project. 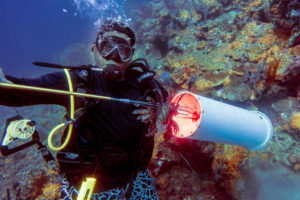 Later I went on a dive with some spear-fishers, who can collect up to twenty lionfish at a time, in a tube called a ‘zookeeper’. 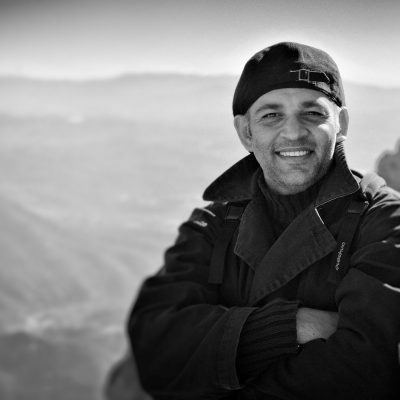 Saint Lucia’s coral reefs and dive sites are its jewels, and the fishers I spoke to explained how they try to kill any small lionfish they see as well as catching the large ones for consumption since, left unchecked, the species could turn these beautiful undersea environments into deserts. 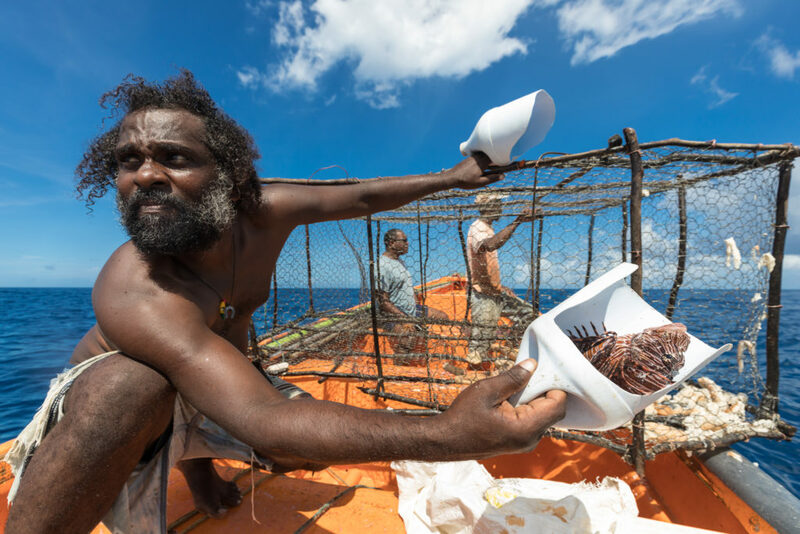 So many people are coming on board with the idea of selling lionfish to hotels and restaurants for tourist consumption, and some fishermen are already starting to specialise. I was struck by the importance of the economic side of the project – behind travel and tourism are locals trying to make a living. The best way to obtain great photos is to get to know local people until they ignore you and let you follow everyday life with your camera. Becoming more familiar with Saint Lucia’s amazing natural landscapes and friendly communities was a real privilege.